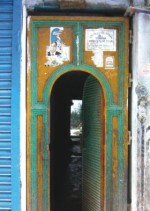 Triple-arched façade in Shakhari Patti. 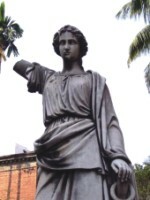 Dhaka, a Moghul city, has many historical sites to explore. However, the sites at old Dhaka are hard to reach due to traffic congestion as well as the maze-like streets. I have found that exploring of these sites on a bicycle gives one a sense of immediacy and historical continuity. It also relieved the stress caused by being inside a car during a traffic jam on a narrow street. Some days ago, I took a group of bicycling friends all expatriates - on a "guided" tour of old Dhaka. I hoped to show off the historical heritage of Dhaka to them. We picked a Friday to avoid traffic congestion. The plan was to bicycle from Gulshan 2 to see old Dhaka sights. We started in the southeast part of old Dhaka and made our way to the northwest part. It was a crisp, cool February morning. We started from Gulshan 2 at 7:15am and bicycled through Tejgaon industrial area, Maghbazar, Kakrail and turned into Nazrul Islam road, made a left into Bangobondhu Avenue and then on to Nawabpur Road. Straightforward, but there were still a few busses on the road, especially near Maghbazar. encourage their shankhari trade. We looked through some open doors to see the famous narrow and deep houses of Shankhari Patti. Two monkeys entertained us perched on second floor verandas and windows. The triple-arch facade of an old house also attracted my friends' interest. But despite many requests I could not get anyone at Shakhari Patti to let us into a house and see the inside. Perhaps it was too early in the morning? We bicycled out of Shankhari Patti, went around Bahadur Shah Park and took North Brook Road towards Farashganj. As we entered the spice trading area, the strong smell of red chilies tickled our nostrils. We ran into a jam caused by trucks delivering wholesale spices and had to walk our bicycles. We found Ruplal House to our right and admired its exterior. 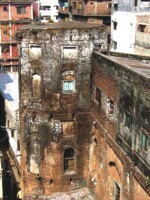 Built in 19th century by a wealthy Dhaka businessman, Ruplal House is now inhabited by families of Armed Forces, and one normally needs special permission to go inside. I tried to reason with the guards (the interior courtyard which I have seen before is beautiful and gives one a sense of times past) to no avail. As we were turning around disappointed, they changed their mind and allowed us in for a quick peek. After checking out Ruplal House, we crossed into the road that runs in front of the Buriganga (Lalkuthi Road) and bicycled towards Ahsan Manzil. Here I made a mistake. I kept going straight to show my friends a frontal view of Ahsan Manzil from Sadarghat Road. 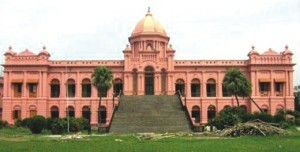 Built during 19th century by Nawab Ahsanullah (most of 19th century Dhaka was divided up between the Nawabs and the Rajah of Bhawal), the restored building is a museum. We should have turned right and taken Patuatuli Road instead, because in front of Ahsan Manzil was a nasty claustrophobic jam that lasted for two or three hundred feet. Trucks delivering wholesale fruits had blocked the road and hundreds of people and van garis carrying smaller loads were also trying to move. We had to get down from our bicycles. It took us 15 minutes to cross this part, but my friends took this little adventure with good humour. Unfortunately Ahsan Manzil opens at 3pm on Fridays. Since Friday morning is the only time the streets of old Dhaka are free of jams, doesn't it make sense to keep this beautiful museum open on Friday mornings for visitors? Keeping our momentum, we went under the Buriganga bridge ramp, and went left into Islampur Road. Shortly we turned right towards the Armenian Church dating from 1781. The caretaker let us in and opened it up for us. It was a surprising island of tranquility - with memorials, one statue and a green, peaceful atmosphere. It was easy to imagine the bygone days of Dhaka when foreign merchants conducted business. We also went to the roof and enjoyed the scenery. 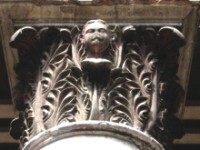 Armenian traders who flourished here for many decades built the Armenian Church. Dhaka, being an important trade centre, had many European communities. Armanitola was Armenian, Farashganj was French, Gendaria = Grand Area was British, etc. Mother Teresa, during her visit to Dhaka, stayed at this Church. Onwards on Islampur Road, we headed towards Chawk Bazar where we turned left into a narrow alley to see Bara Katara, Dhaka's oldest building, now the home of a Madrassah. Bara Katara dates as far back as 1644 or 45 and was built during the time of Shah Shuja Bahadur. I have read two accounts of the purpose. First, it was a caravanserai (inn.) Second, it was a vehicle of charity - income derived from rent, shops, etc was supposed to help the needy. There is also a nearby Chhota Katara. After we viewed the exterior dome and towers, a teacher graciously showed us inside and took us to the roof for some nice views. Inside the Katara, some rooms and passages looked preserved from the original building dates. Other areas had been remodeled. After Bara Katara we bicycled half a km past Lalbagh Fort to visit Khan Mohammed Mridha's Mosque which dates back to 1705. This pretty mosque is built on a platform. The basement served - and still does - as a dormitory. The three-domed roof is typically Moghul. Back we came to Lalbagh Fort which was built during the reign of Emperor Aurangzeb and started in 1678 when his son Azam was appointed Governor of Bengal province. It was never quite completed due to a series of mishaps. I was a bit surprised by the dual admission prices-Taka 5 for Bangladeshis and Taka 10 for foreigners - my friends did not mind the differential in admission. They hoped the money would be used for upkeep. The grounds of the Fort were well kept and beautiful. I overheard a boss-type barking instructions to a gardener on how to prune and beautify the garden. We spent time around the tomb of Pari Bibi (Shaista Khan's daughter.) Then we headed to the Hammam Khana (the royal baths, the size of a small Dhaka flat) and the museum. We finished at noon, enjoying the trip immensely. It was nice to explore this historical city from close range. There are, of course, many other old Dhaka sites, such as Tara Masjid, Chhota Katara, Goal Talab, Hossaini Dalan, Nurjahan House, Chawk Bazar mosque, etc, that could constitute Part 2 of such a trip.